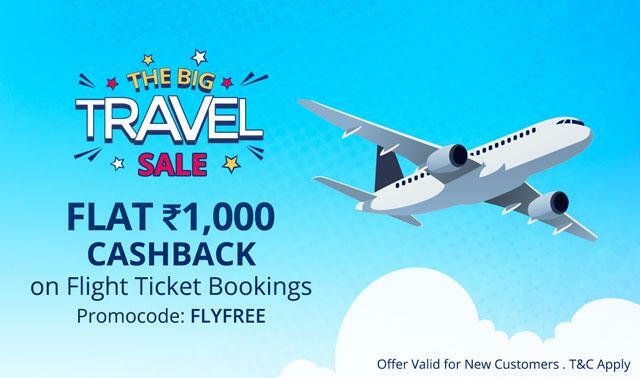 Paytm The Big Travel Sale : 100% Cashback Offer. Paytm Offering Flat 200 Cashback on your First Bus Ticket Booking Using Paytm Promo Code, Paytm Flight Flat Rs 1000 Cashback on First Flight Ticket Booking Using Promo Code, Paytm Train Ticket Offer Zero Service Charge & Payment Gatway Charge on Train Ticket Booking. Offer valid only for new users of Bus Tickets bookings. How to get cashback on Flight Tickets Bookings with Promo Code @ PayTm ?